Thermoplastic Hydraulic Hose Products | ProPulse–a Schieffer Co.
A Leading USA Thermoplastic Hose Manufacturer. At ProPulse, thermoplastic hydraulic hose is 100% manufactured at their plant in Peosta, Iowa allowing competitive pricing and quick turnaround times. Thermoplastic hose offers numerous benefits over its rubber counterpart. Not only does it last longer, it also often comes at a lower cost to you. Because of this, thermoplastic is quickly becoming the preferred material for OEM hydraulic equipment manufacturers who fabricate agricultural machinery, construction machinery, lubrication lines and industrial and material handling equipment. ProPulse has been manufacturing high-pressure thermoplastic hose since 2005. With ProPulse, OD dimensions of 1/8” or smaller are possible. This allows you to fit multiple hoses into very small spaces (similar to Hannifin Parflex hose). In addition to OD dimensions, ProPulse can custom-tailor performance characteristics such as flexibility, kink resistance, cleanliness and weight. They can also customize visual characteristics including customized lay lines/branding and color matching. ProPulse manufactures thermoplastics using all raw material- never regrind. This results in a strong hose that is more resistant to pin hole leaks and other failure. Polyester synthetic fibers are a critical aspect of thermoplastic hose construction. Even with repeated bending motion, the fibers will not weaken or crack like wire braided rubber hose. Thermoplastic hose is able to withstand high-pressure while being 40 to 60% lighter than rubber hose (e.g. 100R8 hose can weigh 40% less than a comparable 100R2 hose). Because it’s abrasion, UV and ozone resistant, thermoplastic hose is extremely long-lasting in a variety of environmental conditions that would typically cause rubber hose to degrade. All layers are naturally bonded together to provide maximum flexibility and kink resistance. 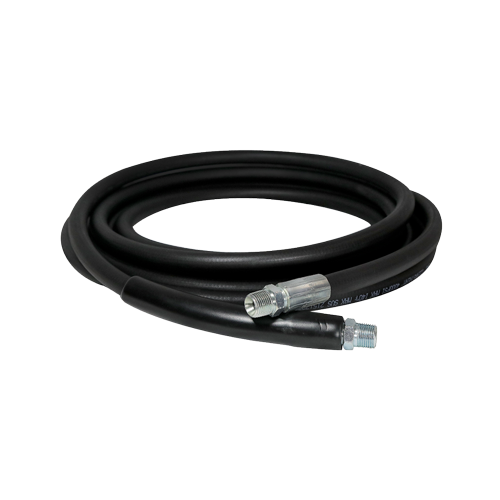 Thermoplastic hydraulic hose is designed with safety and cleanliness in mind. Because the thermoplastic core is self-supported and does not require a mandrel, the chance for contaminants is significantly reduced, leak points are minimized and long continuous lengths of hose are possible. This means less scrap and fewer reel changeovers during production for optimal cost efficiency. And that’s all good news for you.